In Youth Group, teenagers bring their faith into action through worship, community building activities, social action projects, learning and leadership experiences. Youth work with adult advisors to plan and lead events and meetings. Group activities come in all shapes and sizes — weekend conferences, social outings, covenant circles, service projects, worship services, and fundraisers. See our website for a current schedule of upcoming visits. The group meets Sundays from 12:30 to 2:30 pm. Please come and join us. For more information, look us up on Facebook (CUC Paramus Youth Group). We hope you’ll join us for a meeting, conference or training. 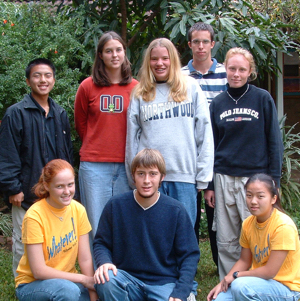 Our Coming of Age program is built specifically for youth at the beginning of adolescence. It’s a time of life that James Fowler, a leading theorist of lifespan faith development, believes is when the adolescent begins to move from concrete thinking to a “religious hunger for a God who knows, accepts and confirms the self deeply, and who serves as a guarantor of the self.” At this stage of adolescence, our youth are asking questions, and forming an identity and faith. What a powerful time to help them understand what Unitarian Universalism is all about! Our Coming of Age (CoA) program is a year-long program for eighth and ninth graders, and it will focus on Community Building, Unitarian Universalist Beliefs, Spirituality, Theology, and Justice. It will culminate in each student writing their own credo (or belief) statement, a heritage trip to Boston, and a credo-wroting retreat to understand how their spiritual self can guide and support their lives. CoAers will work with a mentor, and complete a Social Action project during the year. For the current church year, CUC is using A Place of Wholeness and Words to Live By. Youth, like adults and children, need to be able to talk about what it means to be Unitarian Universalist. Whether delivering an “elevator speech,” taking part in an interfaith dialogue, or conversing with friends at the lunch table, youth need practice in describing our multifaceted faith in terms that are personally meaningful and true. These curricula encourage youth to look inward for a clearer understanding of their personal faith and guide them to express that faith outward into the world. Coming of Age runs from 10:45-11:45 on Sundays. Required for participation: Regular attendance & guardian participation in one orientation session. This comprehensive sexuality education curriculum equips teens with accurate, age-appropriate information to help them make informed and responsible decisions about their sexual health and behavior. Grounded in a holistic view of sexuality, OWL not only provides facts about anatomy and human development, but also helps participants clarify their values, build interpersonal skills, and understand the spiritual, emotional, and social aspects of sexuality. Required for participation: Regular attendance & guardian participation in a parent orientation session.